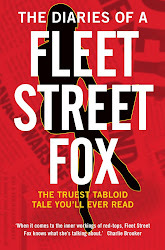 fleet street fox: A Laws unto themselves. POLITICIANS are a wonderful bunch. For a mere £43million in salaries we are provided with endless scandals, ineptitude, and screw-ups. It's about the same annual cost as the Royal Family, with the added bonus there are 648 members of this dysfunctional bunch of humanity and no reasons to feel sorry for them. If their £65,738 salaries were the only price of all this entertainment, I'd be happy to pay. But on top of that comes £93million they claim in 'expenses'. Most goes towards paying staff, who are often relatives. Huge chunks go on constituency offices, generally rented from their party's local branch and so the taxpayer's cash goes into political coffers. Then there's the second homes they all get, allowing these highly-paid windbags to speculate on the property market while we pay for their mortgages, home repairs, furniture, and even food. We all know the inglorious facts of the 2009 expenses scandal, in which leaked documents revealed how we paid for Prime Minister Dishface's wisteria to be trimmed, for former minister Elliot Morley's phantom mortgage, for Margaret Moran's £22,000 of repairs to her partner's home 100 miles from her constituency; for moats to be cleaned, tennis courts to be repaired, duckhouses to be installed. MPs of every party and creed had their snouts in the trough, and when finally exposed mid-grunt by the Press they squealed in outrage at the intrusion while the rest of the nation looked on in disgust. (Since then the committee of MPs investigating the scandal has decided it would far rather look into phone-hacking by the Press. How odd). There were 26 resignations or well-timed retirements, and five convictions on fraud charges. 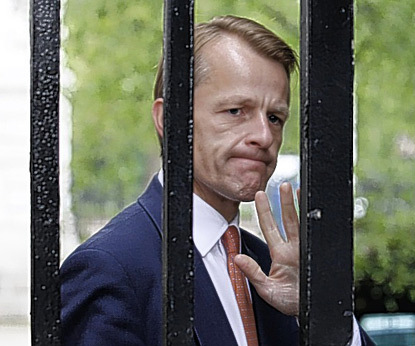 Yesterday one of the resignees, former Chief Secretary to the Treasury David Laws - who lied to the authorities, claimed more rent than his tenancy agreement was for, claimed rent higher than the market rate, rented from his lover, gave that lover £99,000 to buy the house in the first place, and wrongly claimed for building work, telephone calls and the wrong property, all to the tune of £56,592 - said sorry and as punishment was banned from Parliament for seven days. They banned him from a subsidised bar, a river terrace, his mates and an historic palace for a week. Aside from putting a dent in his social life, what was the damn point? Had you or I diddled £56,592 out of the public purse by claiming over the odds for housing benefit and paying it to a lover we'd be up before the beak before you could say "oink". There'd be no "sorry about that", no "shall I pay it back and we'll just forget about it? ", and no prospect of a judge saying "tell you what, take a week off work and we'll call it quits". Mr Laws apologised to Parliament and that was that. He hasn't apologised to us - we are not as important as politicians, after all. He said he'd had a terrible year, his motivation was privacy rather than financial gain because he didn't want to admit his landlord was his boyfriend, and that besides he could have claimed a lot more and didn't, so actually we should be grateful to him. As a result the ever-entertaining Cleggy moralised: "The expenses scandals in the past were about individuals who were fleecing the system for financial benefit and I don't believe that was ever David's motive." OK. Tell me, why else would anyone fleece an expenses system? I don't care if Mr Laws is gay, straight or wobbly. If he felt like staying in the closet that's up to him but the best way of doing that was a) not to live with his boyfriend, b) not commit fraud for the benefit of his boyfriend, and c) not steal from the public purse, the use of which is often inclined to bring public scrutiny. His homosexuality has been offered up like a speccy kid waving his glasses and saying "don't hit me! ", making it appear unreasonable to criticise him. Had he offered such a defence in court a judge would have laughed in his face, and rightly so. Sexuality is not an excuse for criminality. When there's too much talk about their expenses MPs are inclined to be snide about journalists and our ability to claim for all sorts of things. But we are like every other business in Britain - to make a claim I have to prove I spent the money in the course of my work. I have to produce a computerised receipt and a story from every dinner or drinks. It gets scrutinised by a scary man with a red pen who can demand I explain myself and if I've done anything wrong I can be sacked. The laptop and the phone don't belong to me and I certainly don't get my bloody furniture paid for. MPs don't have to produce receipts. They don't have to prove they worked hard in return for their expenses. No-one is able to question or sack them except other MPs. And they get to keep the houses. I'm quite keen on the idea of a dormitory for MPs. It would be a lot cheaper and they're bound to get up to even more shenanigans with which to entertain us. Anyway in a week's time Mr Laws can skip back into work where his future's looking rosy. Dishface said the fiddling fraudster "is a very talented figure" who "has a lot to offer public life and I hope stays in public life". Vince Cable said: "I'm sure we'll see him back"; Michael Gove hoped "that we will all be able once more to make use of his talents before too long". They want him back for his creative accountancy skills and because he is "the best brain we have", according to Cleggy; and also because he was replaced by talking squirrel Danny Alexander, a man so dumb yet on-message he gives every impression of being a humanoid Speak-and-Spell. Yet seeing as Mr Laws was stupid enough to be caught with all ten of his fingers as well as his winky in the till, I quake for the intelligence of the other 647 - all of whom seem to think we're stupid. This man is not behind bars.